I trained my way in again, hoping to see some TNT/TBS names this time. However, they didn’t seem to be there, so after awhile, I moved on. I tried to avoid the subway as much as possible, when it wasn’t pouring, so to keep the blood moving. Towards the end of the walk, I see a guy I recognize, but can’t recall his name. I knew he was on The Sopranos though, and he was super nice. It was Al Sapienza, who played Mikey Palmice, great character. I arrive to the usual CW mess, as well as Joresky, Class, and a few others I know. I stood at the back of the pen, which I often prefer, as I can spot people walking up. In this case, it worked again, as I spotted Monet Mazur, who I know from Torque and Whirlygirl films. The CW people were pretty bad here, not stopping, so I left. I tried an event for Kate Mara and Jamie Bell, but the security was bad, so I left. This was both brilliant and stupid though! So I walk uptown, and head to an event honoring David Wells NY Yankees 1998 perfect game. The venue is a mess, with ticket holders, graphers, and gawkers everywhere. I had zero intention of waiting here, but I run into my friend Joe. He and I decide to walk back up to the CW spot to hang out. Here’s the brilliant part, so on the way, I spot the gigantic Stephen Merchant, a huge want of mine, and he does photos for us! Unfortunately he was on his way to a show, so he couldn’t sign for me, but as he was the #1 Turner want of mine, huge stroke of luck! Joe departs, and I head back to the other spot. While waiting, another stroke of luck! In comes former G4 host of Attack of the Show, Kevin Pereira, who I never see during TV week. This was a major want of mine for like 10 years! After awhile more of nothing, I get my friend Josh again to follow me to another event. We take the train, and arrive to see a few dealers and a couple paps. None of us are sure where they could leave from, and I’m not positive who’s even there. My hope is that one of them is former NASCAR legend Jeff Gordon, who I’ve failed on the photo a few times before with. Out comes Jeff though, and Josh and I rush over and get him. Unfortunately, at the same time, Elizabeth Hurley left from the side doors, and nobody got her! Damn. Mary J. Blige also leaves from there, and some go for her. We don’t budge though, because we want to be sure we don’t miss LL Cool J leaving the front, after hearing that he’s in there. Sure enough, there he goes. We run up, and he does photos no problem! Again, another easy name I’ve wanted for a long, long time. At this point, it’s getting late, and while I should have checked out the Mara/Bell spot exits, I decided to head for Penn again, to take the train home. Next time for them. On the train again, and I am really worn out, especially my feet and knees. My want is another long delayed one, the lovely Alyssa Milano from Who’s the Boss and Charmed. NJ Transit was delayed pretty bad though, and I was cutting it close on time. Finally I get to Penn, and run to the 1 train, which thankfully moves pretty fast. I arrive to a full barricade, and figure well, I’m not getting squat here. Luckily, the guard moves part of the rail, and space opens up, and I jump over along with two collectors I know. Alyssa exits, and pretty much racked it. I got the full combo…FINALLY! I swear, every time she does a NYC signing or appearance at a store or something, I can never go. I catch up with Class at the CW spot again, which is a waste of time, nobody really stopping. We get Lily Cowles (Roswell reboot), and little else. Class had success with Joe Elliott of Def Leppard so I join him for the way out. This wound up taking twice as long as we thought. Finally Joe leaves, signs, but no photos. We are fairly sure where he’s going next so we start walking. Soon enough, Class is running, I am NOT. I just couldn’t do it, my legs were worn out. The car hit a green light, and I gave up, while Class got there in time. Finished the night at a spot that Benedict Cumberbach was performing at. I don’t care much for him, but wanted the other big names due. However, most did not show, and I just got his Sherlock co-star Louise Brealey. As it got later, I really had no reason to stay here, so I went back to Penn to get the train. With my body and brain beginning to seize up, I started the Google Map app, and began sweating bullets. I had to get back to my car, then stop home, and back out to Morristown, NJ, to catch Jay Leno before he left the venue he was performing at. In all of this, I forgot to remind Lanza about it. I floored it on Routes 46 and 80, and arrived in time. There were a few old timers and myself, but Jay was super nice and damn funny out there. He signed what we both agreed was a terrible movie’s DVD, Collision Course, which he co-starred with Pat Morita in. I tried a spot for the Netflix’s Mindhunter series, hoping to score director David Fincher of Fight Club, Alien 3, The Game, Gone Girl, and Zodiac. In other words, I love his work. There were about 8 of us waiting, and he signed a lot. 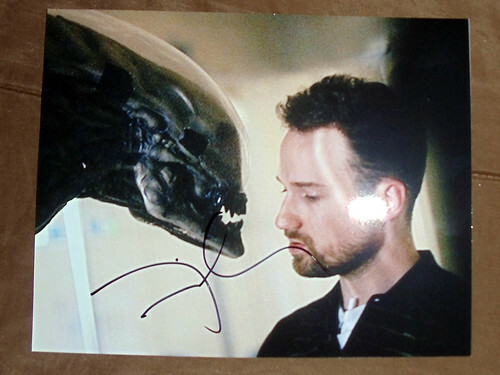 Although I had to prod him a bit to sign Alien 3 photo. Unfortunately, I couldn’t get a photo with him, as the guard pulled him away. I didn’t get the cast members either, as I focused on David. A “master” though snapped a photo of me asking him to sign the Alien photo though, ha ha. Sadly, the master's phone crapped out, and he was forced to reset to factory and lost my pic! I hit the Benedict spot again, although this time the guest list was far more impressive. In hind sight, I should have gone for the way in, as I heard James Earl Jones signed. Also on hand were Ben Foster, Katie Holmes, Lauren Graham, and others. While we waited, we were treated to several smoke breaks from Chevy Chase and Laurence Fishburne, but nobody was brave enough to ask either jerk. On exit, Benedict ran to the car, and sadly most others were hurried out, including Molly Ringwald and my main want there, Ian McShane. I did score Clarke Peters from The Wire, and finally Rose McGowan. I attempted to find the after party, but comically failed on that, so I went home. To officially close TV week, I hit a venue I’ve done the last few years. 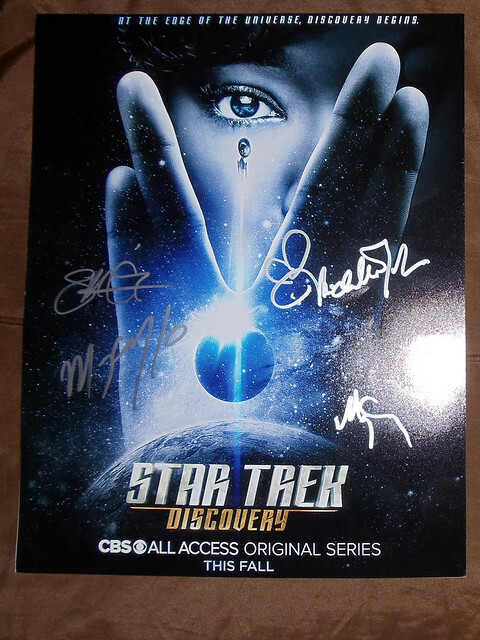 My primary wants were the female cast members of Star Trek Discovery, Sonequa Martin-Green, Mary Wiseman, Mary Chieffo, and the somewhat rare Michelle Yeoh from Crouching Tiger, Hidden Dragon and 007 Tomorrow Never Dies. I had a cast piece to start as well, though why I waited until now I don’t know. I started at a spot I figured they leave from, and was able to score combos with Sonequa and Chieffo here. I moved to the event space, but Wiseman didn’t stop, and Michelle wanted to but was told she was running late by security. On the way out thankfully, I got the Wiseman graph (had photo), while Michelle took care of many people, and I got the combo. There were some others I needed later in the day there, but with nice weather finally, I drove home and hung out in the yard with the dog.